If you love the Universe as I do, and already own a telescope, perhaps with the time you have lost some of your enthusiasm. Most likely that’s because you’ve seen all what you have ever dreamed of. If you still didn’t try various filters, then I have good news for you. You can forget everything you have seen until now and rediscover the night sky again. But from very new perspective. This time with much more colors, sharpness and contrast. Whether this will be the polar caps of Mars, or some distant nebula, looking through telescopic filters will definitely enhance your midnight experience. Like photographic filters, these for telescope increase detail and improve contrast. They do it by removing unwanted color of the wavelength of light. The most common “junk” light is the one comes from the light pollution. If you are an amateur astronomer and live in a city you probably know what I mean. Unfortunately, light pollution can kill your enthusiasm even if you’re miles away from the downtown. Fortunately, there are filters that magically will clear the image from light pollution, do not cost a fortune, and they gonna make love your telescope much more! Order now, and while you are waiting the little thing to get delivered, start putting out the Telescope from the closet. Moon – the closest object to Earth, and why not the most frequently observed, also looks far more beautiful if you look in details with Polarizing Filters for Observing the Moon. Did’t try yet? Well, believe me, the Moon is so bright that you have miss a lot. Because of the brightness, your pupil of the eye is shrinking, so much less light is getting to your eyes. And you know best – less light, less details! An important role plays the filters for observations Planets and objects in deep space. You might argue about filtering of light – you gave a lot of money for large aperture exactly to gather more light. But in Astronomy not every light is helpful. Certain wavelengths of light coming from, for example, a nebula, do not contribute to detail. If you remove them, the image that remains is much sharper and have better contrast. Telescope filters do just that: eliminate light that does not add any detail to the object. What remains is a much cleaner image, that lets you see the finer details with better contrast. Different objects require different types of filter to see them best. Jupiter’s Great Red Spot needs a different filter than this for polar regions of Mars or Venus’s clouds. 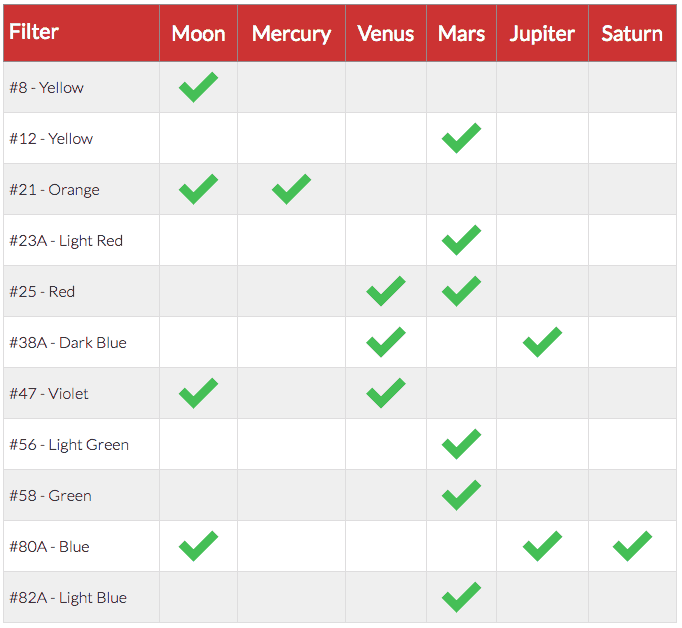 In the chart below you can find the appropriate filters for the various objects. If you are looking to buy a solar filter for your telescope, then let me tell you that it is almost impossible to find the right one for you. The reason is that unlike other filters, solar one does not apply into a standard 1.25 inch eyepiece, but should be put front of the tube, where all light gets in. Now days there is countless types of telescopes in the market with different sizes and solar filter should fit perfectly on your telescope. Something very important !!!! Never Ever point your telescope to the Sun without sun filter and never look through the eyepiece. You risk losing your eyesight, and damage the telescope. So, after it became clear that it is difficult to find a ready solar filter for your telescope model, the next thing you can do is to create one. If you are from those who are not very handy, it means we are much alike. I’m not that “always creating something” person, but my desire to look at the Sun was so big that I couldn’t resist. For my big surprise making a Sun filter was not only easy but also very enjoyable work. The solar sheet can be ordered by the review further down in this page. For my 6 inch telescope, 10 inch square perfectly matched the filter which I made. Follow the steps in the video and you will succeed. Here are some pictures from my personal experience with the preparation of the filter. And the prize? Well, you will have to look at the sun with the telescope. 7 1.25inch filters for telescopes in a set. Include 1 Crystalview Moon Filter, 1 Polarizing Filter #3, 5 planetary filters: No.56 Green, No.12 Yellow, No 23A Red, No.21 Orange and No.82A Blue. Crystalview Moon Filter—–Enhance Lunar Planetary Views – Eliminating the Street Light Smog. Polarizing Filter #3—–Enhances the contrast of the moon and planets in photographic images. 5 color planetary filters — The five color filters (Red, Blue, Green, Orange＆Yellow) highlight features on Mars, Jupiter, and Saturn.They are an essential tool of the lunar and planetary observer, for filters permit the observation and photography of surface detail that is often virtually invisible without filtration. All filters has M28.5×0.6 1.25inch standand filter thread on both sides. With Metal Frame and Optical Glass. Black polymer is the most common filtering material for observing sunspots and granulation, through telescopes and binoculars. Make a filter on your own for any telescope / binoculars / camera, and for a fraction of what factory made filters cost. The sun will appear in a natural orange color when viewed through your telescope using this filter. WARNING: ALWAYS MAKE SURE THE FILTER IS WELL ATTACHED TO THE TELESCOPE/BINOCULARS, USING STICKY TAPE, TO KEEP IT FROM FALLING WHILE OBSERVING! I would love to own a telescope myself. Living in Norway, means not as much light polution as in other places in the world. I suppose there is not a one-filter-fits-all-planets filter, but the complete set for different views sounds pretty awesome. I am not a handyman either when it comes down making sunlight filters. I am not sure if I would even dare to attempt making such, but it was a clear manual at least. Thanks for your review of the lenses. I will bookmark this site, for I should find out more about telescopes before I buy one. I’m not most interested in the sun, but very interested in everything else visible here. Every night I can clearly see the milkyway. Got any recommendations regarding a good beginner telescope? Norway is a wonderful country in which, besides the endless night sky, you can also see the northern glow for which I noblely envy you. Unfortunately, light pollution does not depend on the geographical location, but on the size of the city you live in. Larger city – more pollution. If you want to get a Ð¢elescope, then here on the site there is a pretty detailed information what you need to know to make a purchase. I have also looked at my favorites of every kind. If you have any questions – I am always here to help. Thanks for the comment and good luck! Yup, you should definitely try to look with some filter. It’s totally different experience! You can start with that for the Moon. Your eye will appreciate it most and you will be able to see much more details. I’ve just gone through your post on filters. Though I’m not astronomy student, yet I love Telescope. And definitely I want to own one. Your write-up is really helpful for mes as I have come to know about filters that are used to observe different planets. Also the video ‘polarised light’ is very impressive. Thank you for such great post. Thanks for the comment! If you have some free time and looking for a new hobby – try Astronomy! Get a Telescope and be inspired every day (actually night, if we have to be more precisely) You gonna Love It. Everyone will!